Question: Which plugin appears first in Google when you type in “WordPress SEO,” has over one million active installs, a 4.8-star rating in the WordPress directory and is a regular on the favorite plugins list? If you just answered Yoast SEO you would be correct. The plugin by Team Yoast is one of the best WordPress plugins out there. It is powerful, offers tremendous value, has meticulous support, and is used by literally hundreds of thousands of users. That includes me. 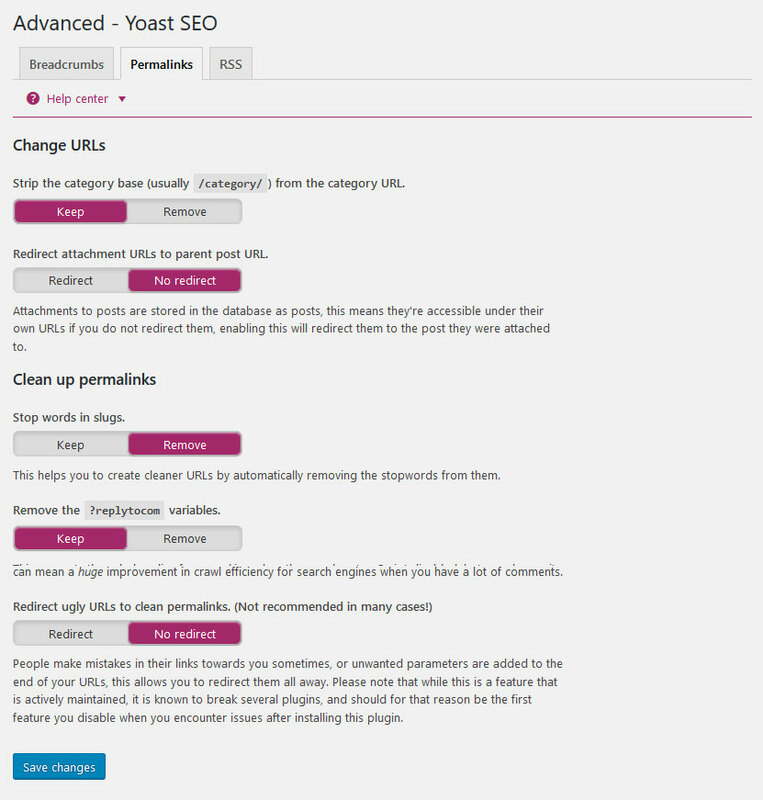 I install the Yoast SEO on basically all of my blogs and client websites. However, with its multitude of settings and complexities, setting it up can be overwhelming — especially for beginners. 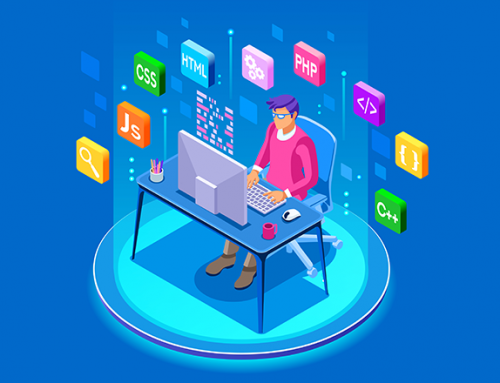 Therefore, in this article, we will take an in-depth look at how to use Yoast SEO — from setup and configuration to day-to-day use. We have a lot of ground to cover, so let’s get going. 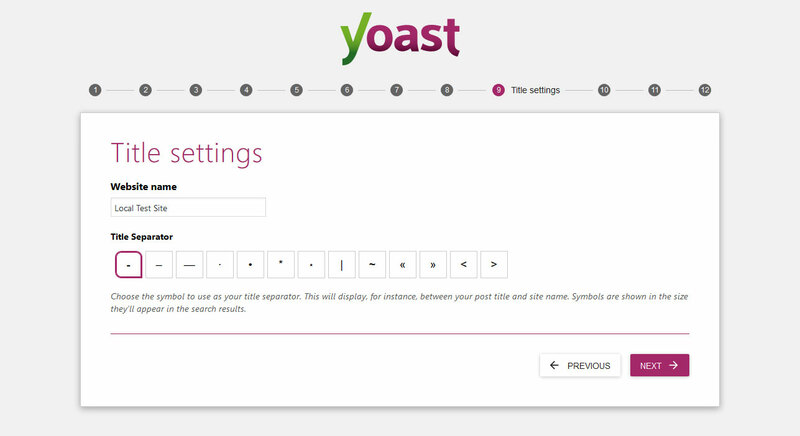 The plugin is installed the same way as any other: Go to Plugins > Add New and type Yoast into the search box. It will show up right at the top. Hit Install and activate once the installation finishes. After that, you find a new menu item called SEO in your WordPress dashboard. From here, you can control your site’s global SEO settings. 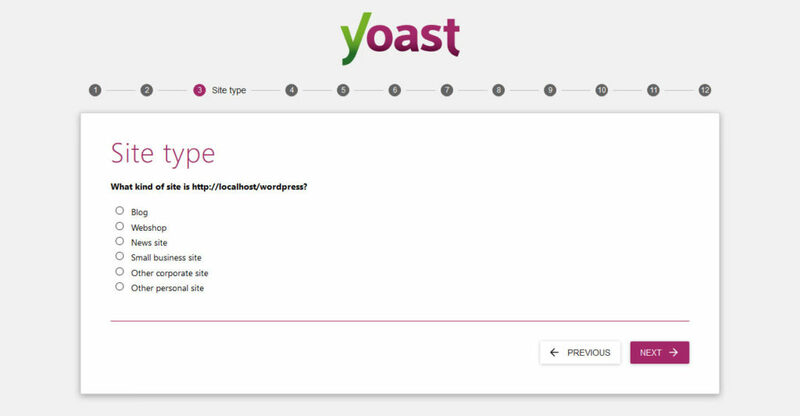 Yoast SEO has both site wide configuration options and those set on a per-page or per-post basis. We will start with the former. 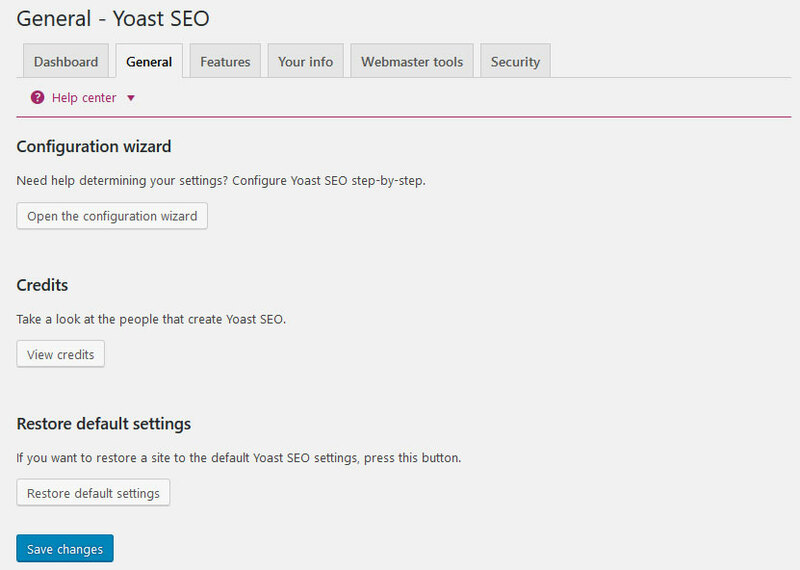 Configuring Yoast SEO is a bit of work since there are a lot of settings to go through. However, it’s a necessity to ensure your site appears correctly in the search results. The first thing we will deal with are the general settings. 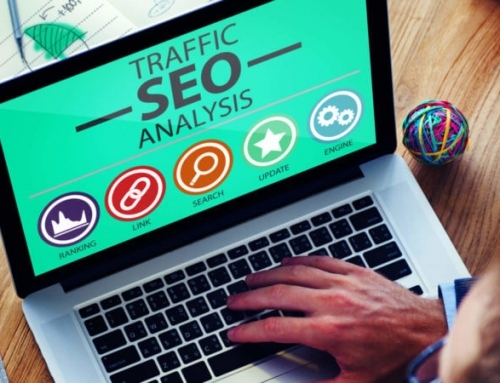 Here you can set up SEO basics for your site. It’s where you land automatically when you click on the new SEO menu item. On the first page is the notification center. Here, the plugin will display any problems it has discovered with your SEO so you can take corrective action. For example, it might tell you to connect your site to the Google Search Console, if something is wrong with your robots.txtfile and other issues. By the way, if you are ever unsure about what to do on a particular page, you can always click on help center at the top. This will open a menu with video tutorials, access to the Yoast knowledge base and other ways to learn more about the plugin. In an earlier version of Yoast SEO, users were confronted with multiple menus and loads of configuration options. By now, this has been replaced by a configuration wizard by default. However, you can still bring the original menus back as we will see in a minute. For now, however, let’s go through the configuration wizard. It will help you set up the optimal SEO settings for your site. Click on the button to start it. When you do, you first meet this welcome screen. 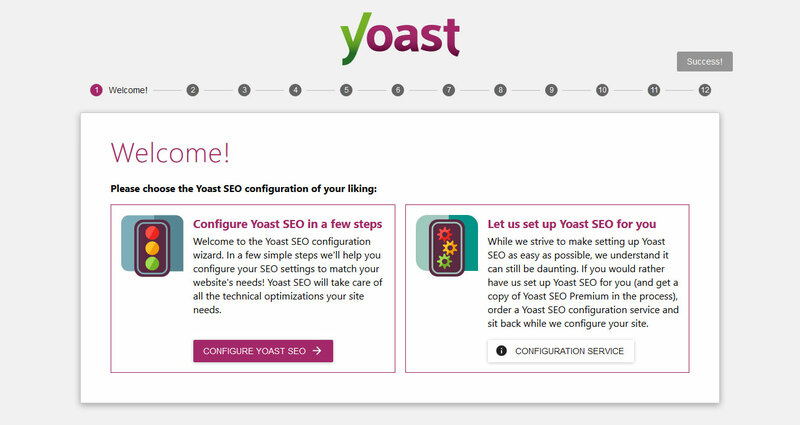 There’s nothing to do here but click on Configure Yoast SEO. Unless you want to use Yoast’s premium service to have their team set up the plugin for you (prices start at $149). In this next step, you have to choose your environment. It can either be a live site, staging area, or local development site. Pick what is appropriate for you and move on. Then, the plugin will ask whether your site represents a company or a person. As the on-screen text says, this is important for Google’s Knowledge Graph. That’s the extra bit of information Google sometimes displays on the side of the search results. Whichever you choose, in both cases the plugin will ask you to provide a name and, if you choose company, a logo file. In the next step, it’s time to input all the social profiles associated with your site. This will help search engines determine what else is part of your online real estate and enhance your metadata. In the following screen, you are then able to determine which parts of your content Google may see and index. Standard options include posts, pages, and media. Depending on your site configuration, you might have more. The media type is set as hidden by default and it makes sense to keep it that way. After moving on, you are asked whether your site will have more than one author. Then, it’s time to connect your site to Google Search Console. For that, simply click the big purple button that says Get Google Authorization Code. This will open a new window where you need to log into Google or use an existing account. 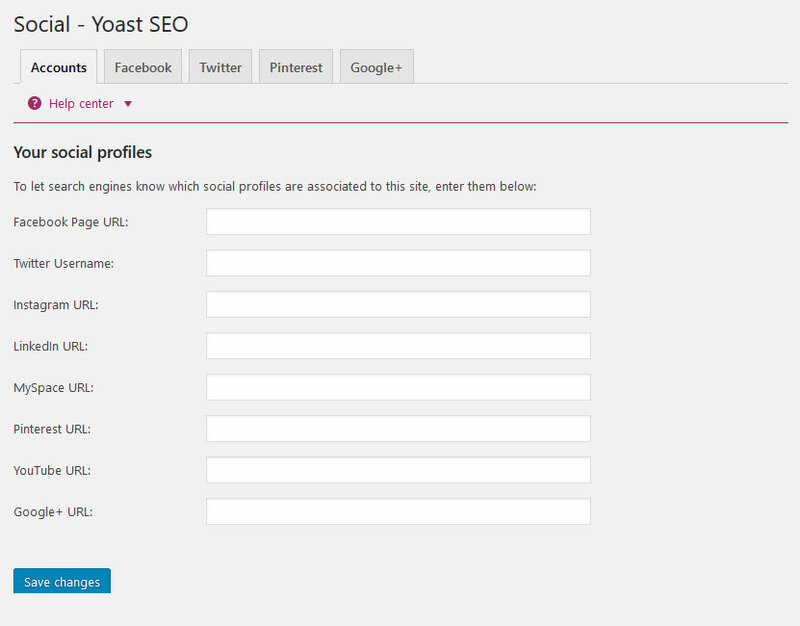 After that, you need to authorize Yoast SEO to view your data. 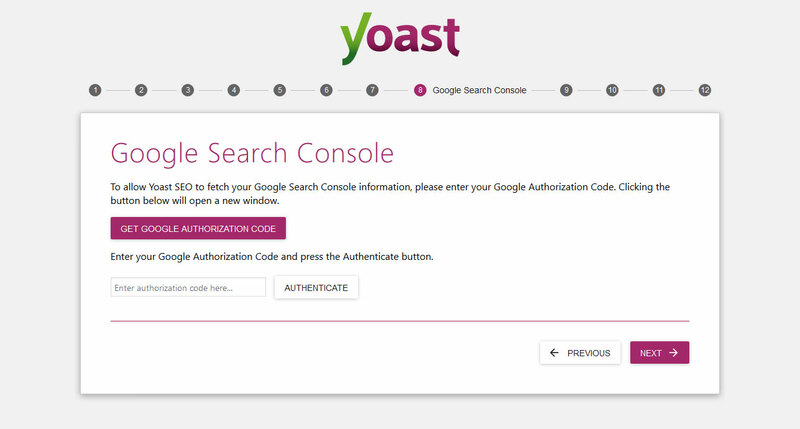 This gives you an authorization code to copy and paste into the box in the Yoast wizard. After you are done with that, click Authenticate. The last thing to do is choose the site you want to track from the drop-down menu. Then you can move on. The coming page only gives you two options: site name and title separator. If you want to provide search engines with a different name for your site other than the site title, you can do so here. 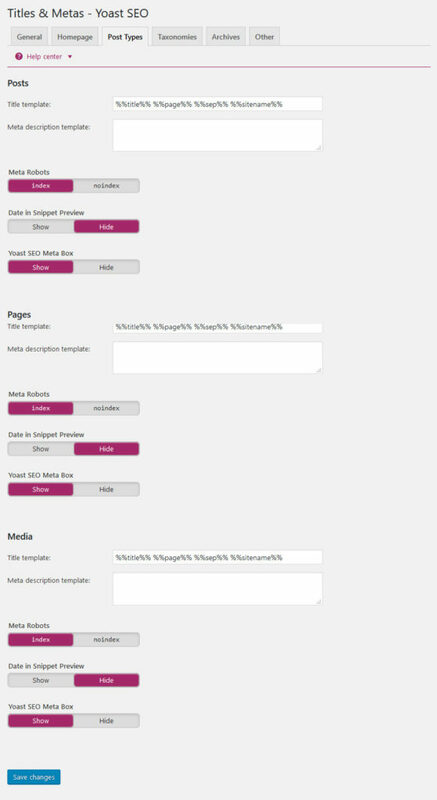 Also, pick a separator for your page titles. This is purely cosmetic and therefore completely up to your taste. That’s it. You are basically finished. The last few steps are only about signing up to the Yoast newsletter (which might be worth it as they are one of the biggest authorities on WordPress SEO out there) and purchasing optional premium offerings. Once you are done with that, you have taken care of the basic technical optimization of your site. Soon we will show you how to take this even further, but for now — good job! Readability analysis — Controls the Readability tab in the page settings. Don’t worry if you don’t know what that is yet, we will talk about this in further detail below. Keyword analysis — Also part of the local on-page SEO settings, more information to come. Advanced settings pages — With this option you can bring back a lot of the settings pages that were replaced by the configuration wizard. Switch this on for more control over your site and to access the menus we will talk about further below. OnPage.org — This is a service that checks daily whether your site is indexable by search engines and lets you know if it’s not. Admin bar menu — After installing Yoast SEO, you will notice a new icon in the WordPress admin top bar. It contains links to third-party services and lets you know when there are notifications. You can switch it on or off here. 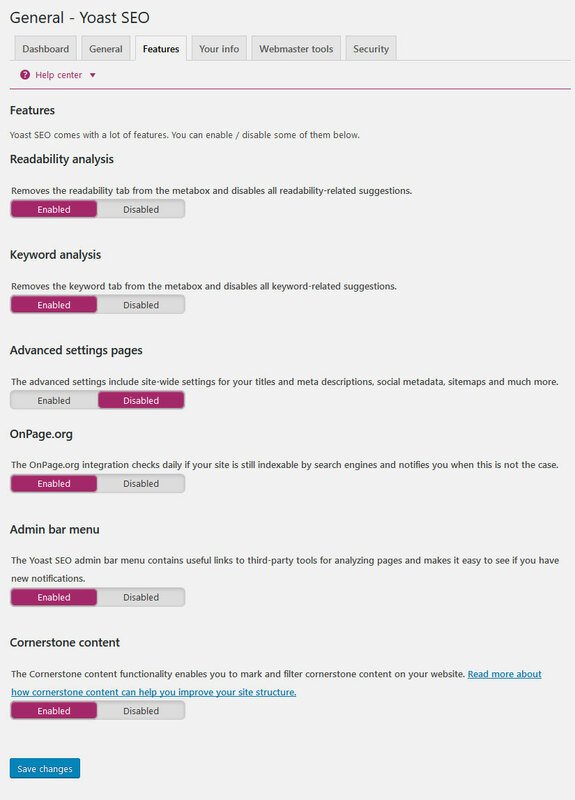 Cornerstone content — Control the cornerstone content settings for posts and pages. We will talk about what that means in a minute. If you make any changes here, don’t forget to save! Contains basic info about your site. We have set up most of this already in the configuration wizard. Website name – If you want to provide Google with a different name for your site other than the site title, you can do so here plus one more alternative. Company or person – As mentioned, this part is for Google’s Knowledge Graph. By stating whether you are a company or a person and providing an image and/or name, this info will sometimes appear on the side of Google’s search results. 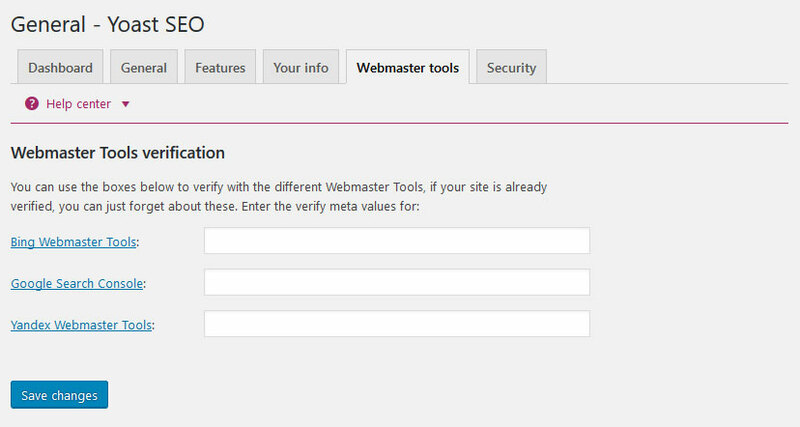 If you are registered with one or more of the different Webmaster Tools (as you should), you can populate the fields here to verify your site. These tools provide you with insights and data on your traffic from the different search engines. Ignore this part if you have completed the verification in a different way. 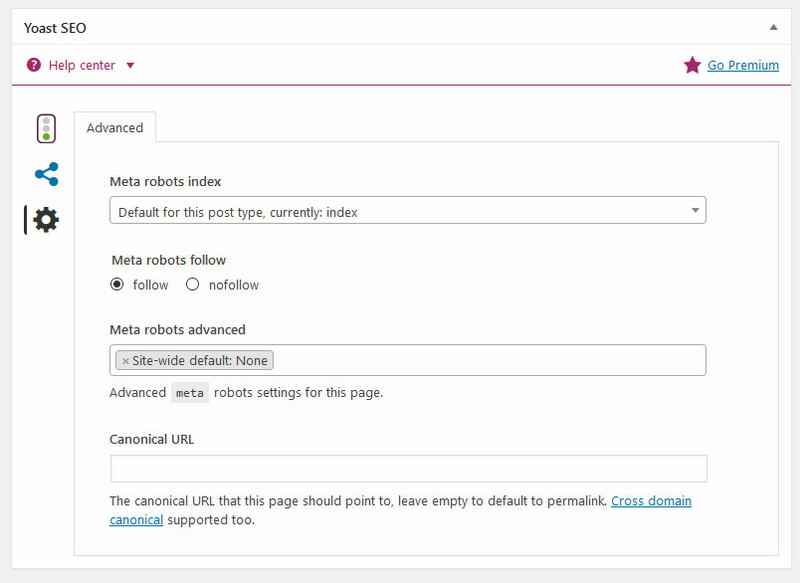 Disable the advanced parts of the WordPress SEO meta box — Checking this setting is recommended for multi-author websites if you don’t want to let others set advanced options for your posts and pages. Alright, now that we are done with General Settings, we will move on to Titles and Metas. Here you will configure how your content will show up in search results. Be aware that you can only access this and the following menus if you have enabled Advanced Settings Pages under Features. Here you can change the title separator for your site. We have already dealt with that in the onboarding wizard. As mentioned, it’s only a matter of taste and not really decisive for your SEO. Here and in the following option tables you are able to set the title format for a number of different pages. As you will see, the title fields are pre-populated with variables. Click on Help Center on top for a full list of all the variables you can use to configure the title format. 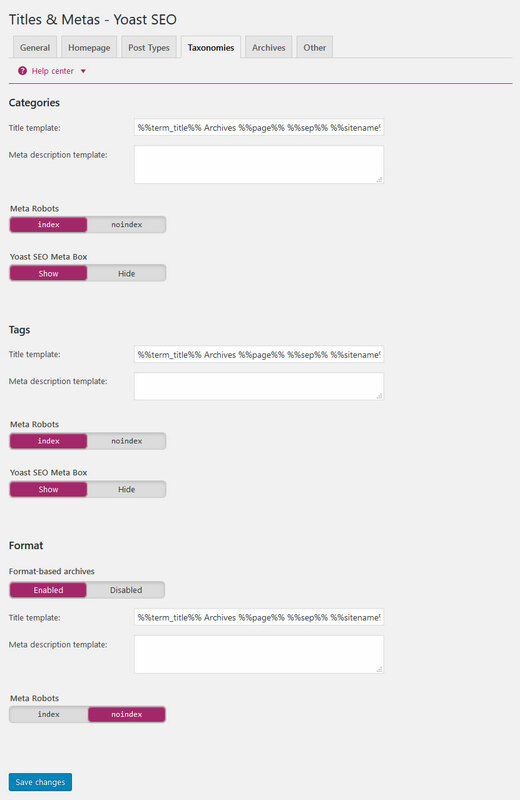 Title Template – Sets the format of your homepage title. The standard setting should be fine for most websites, however, you are welcome to change it if you want. Meta Description Template – In the same vein, you can also provide a template for the meta description of your homepage. Meta descriptions are the text that appear under the site link within search results. For example, you can automatically use the post excerpt (by inserting %%excerpt%%), however, I prefer to configure this manually for every post and page. Note: In some themes or older versions of the plugin you might see links that take you to Settings > General in the WordPress settings where you can fill in the same information. This is where you set the title format and meta description template for your posts, pages, media pages, and any custom post types. Again, whatever you set up here you can always overwrite locally. index, noindex — By changing these settings, you are telling search engines whether or not to add this content to their search results. Use it to avoid penalties for duplicate content and to keep content out of SERPs that you don’t want to see there. Date in Snippet Preview — This setting is disabled by default which makes sense for websites with evergreen content. However, if you are running a news site (or update your content regularly), you should consider switching it on. 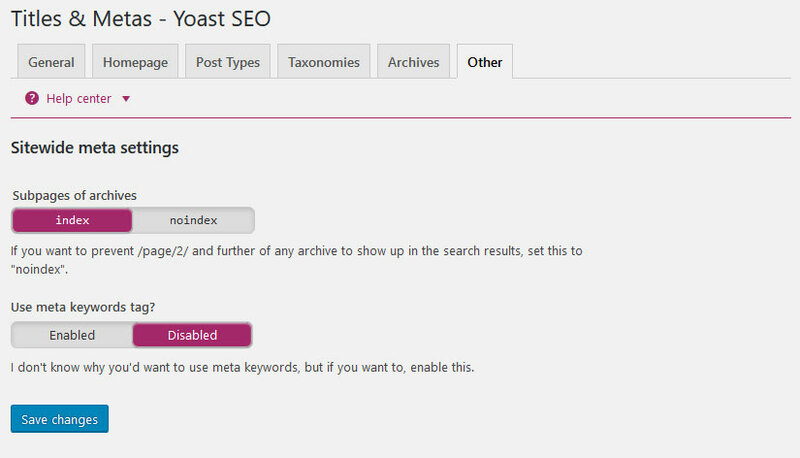 Yoast SEO Meta Box — If you are not going to edit the meta information for any of the post types, you can disable the meta boxes that the plugin will create here for a cleaner UI. As for how to set up the title templates of your pages, it is a good idea to go with post title first, followed by your site name. Search engines and human visitors care more about the beginning of your title, so that’s where your article’s topic should appear. Then it is also a good idea to attach your brand name to posts so people can start recognizing you in the search results. 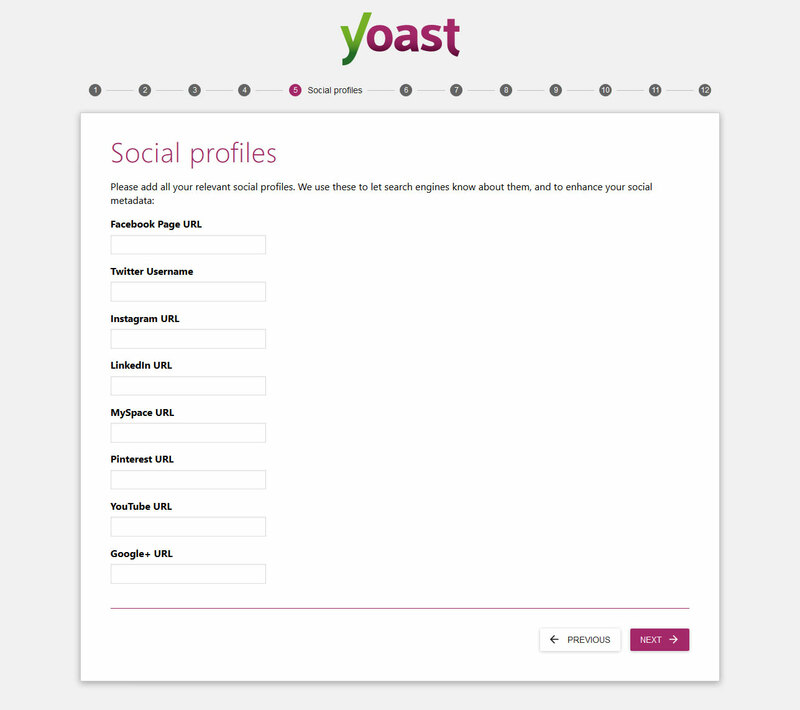 Yoast’s standard settings are sufficient for most cases. Furthermore, if there is any content type on this page that you would like to keep from being indexed, you should do so by using the respective option. WordPress creates some taxonomies by default — namely categories and tags. Depending on your settings, you might find additional ones on this page. Again, the standard title format should be fine so there is not much to do here. You can provide meta descriptions and SEO titles for taxonomies on a local level later. Additionally, I don’t really use tags, so I disable them from being indexed. This is also smart in case you use the same words for tags as you do for categories so as not to run the danger of creating duplicate content. Besides setting the titles for your different archives on this page, the biggest concern is to determine which should be indexed and which shouldn’t. WordPress comes with a number of archives by default and not all of them make sense for every site. Author Archive — If you run a single-author blog, the author archive will look exactly like your normal blog page. You should, therefore, set it to noindex or disable it completely to prevent duplicate content. Date Archive — This doesn’t really provide any important info to search engines, so you can leave it as noindex. Search Pages, 404 Pages — These pages will not show up in search results by default. Configure the title format here and you are done. (Check out the article on how to build a custom 404 error page for WordPress). Some additional meta settings for your entire website. Subpages of archives – Archive subpages are not that crucial to search engines. Decide whether or not Google and others should add them to their SERPs. Overall this option is relatively unimportant. Meta Keyword Tag – Meta keywords don’t really matter anymore, so you can leave this disabled. Now we are getting to the options for social media. I probably don’t have to tell you that social platforms are of SEO significance these days. Therefore, there are a bunch of pretty important settings to adjust here. All you have to do here is enter your social media accounts. This will signal to Google that they belong to your site and might cause them to show up on the side of the SERPs when someone searches for your brand name. If you have gone through the configuration wizard, this should already be filled in. This and the following subsections exist mainly to ensure that your content looks its best when showing up on different social platforms. Enable Add Open Graph meta data. 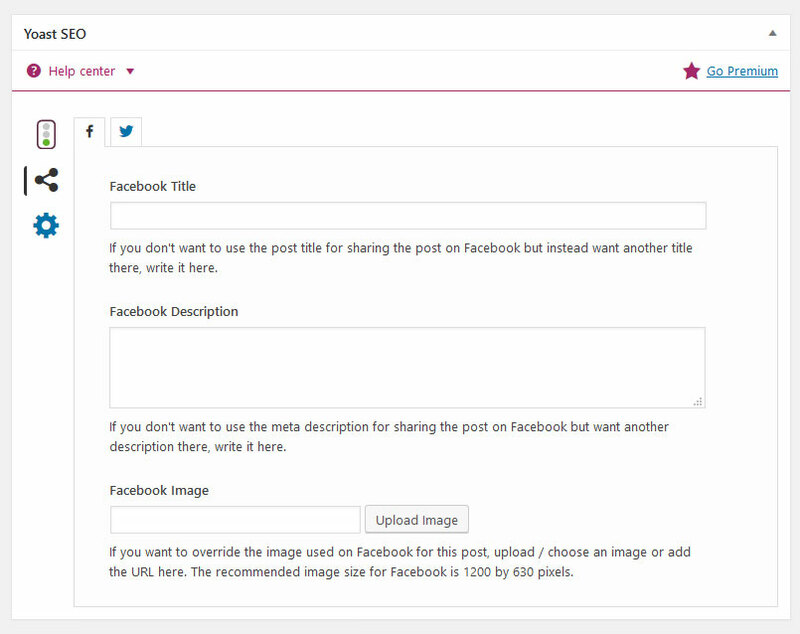 This allows you to define your own title, meta description, and image for Facebook in the WordPress editor. Further down you can also provide the same information for the front page of your site. Plus, you may provide a fallback image that Facebook will use in case the post of a page doesn’t come with its own. Should you have a Facebook page you can also add your admin here to get insights into how much traffic your page is generating for your website. Pick which type of Twitter card you want your site to have. I recommend Summary with large image. If you want, you can verify your site with Pinterest here by adding the meta tagprovided by the platform. Optionally link to your Google+ publisher page. Sitemaps are essential for WordPress SEO. They provide a roadmap for search engines to crawl your site and are the easiest way to notify them about changes to your content. Generally, there isn’t much to do here. 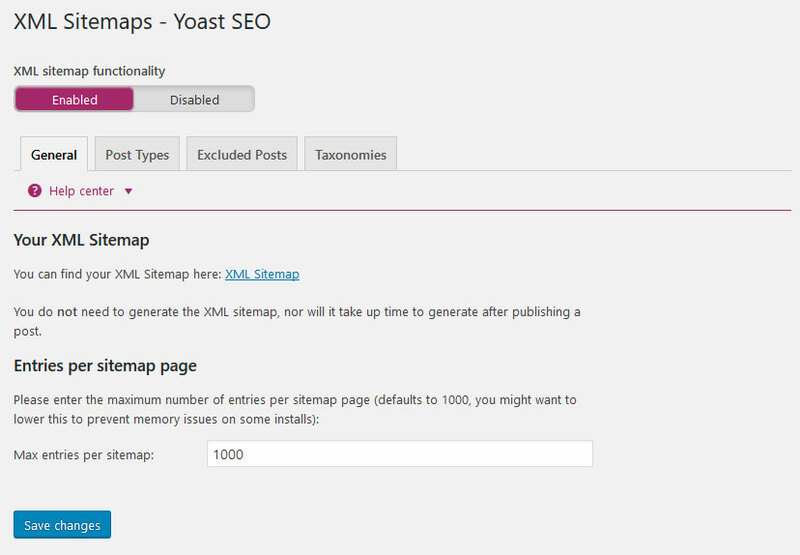 Just make sure that XML-sitemap functionality is enabled and the plugin will do the rest. No need to do anything manually. What you do have to do, however, is take the URL of your sitemap (you can get there by clicking the button with ‘XML Sitemap’ on it) and verify it in your Google Search Console. Go ahead, do it now. I’ll wait. By the way, you should also make sure not to have any other plugins enabled that create sitemaps. That would just be confusing the search engines which is the last thing we want to do. User Sitemap – Choose whether or not to include authors in your sitemap. The recommended setting is no and you can usually leave it that way. If you do enable user sitemaps, you may also choose which user roles to include and whether to include users without published posts. Post Types – Exclude post types that you don’t want in your sitemap. This refers to anything that doesn’t deliver value to your site. Media pages are just one example. You might also have custom post types in this list. A good rule of thumb is to disable anything here which you have set to noindexearlier. Excluded Posts — Here you have the option to exclude specific posts by inputting their IDs. You can find out a post’s id by hovering over its title in the Posts menu. Check the link your browser shows. The post id is what follows post=. Taxonomies – In the same vein as post types you should decide which taxonomies, if any, to exclude from your sitemap. As the name suggests, this menu contains a bunch of advanced settings. Most of those are optional but still worth understanding. In case you didn’t know, breadcrumbs are links at the top of your page which display the path users have taken to get to the content they are currently viewing. Not only is this very comfortable from a visitor perspective, but breadcrumbs also help search engines understand the structure of your site better. They will even sometimes show up in the search results in place of the usual URL. Enabling breadcrumbs is not a must. Yoast recommends it, however, I think it is also a matter of personal preference. If you do decide to get them on your site, there is a tutorial on Yoast.com. The same menu also lets you configure the design of the breadcrumbs. Be aware that this is a different menu than the one found under Settings > Permalinks. The plugin will only let you adjust additional settings for your URLs and assumes you have already switched your site to pretty permalinks in the WordPress settings. Strip Category Base – Remove /category/ from your category archive links. I can completely understand why you would want to do that, however, the feature is prone to malfunction and Yoast says it’s not too important for SEO. I believe him and keep my hands off of it. Redirect Attachments – When enabled, people who find your images or other attachments via Google will be redirected to the post, not the attachment page. If your website has a lot of images, enable this to prevent having a lot of low-quality content. 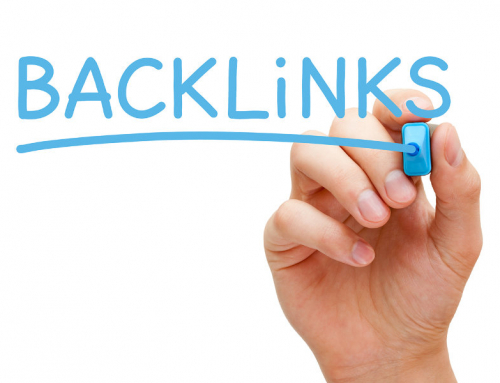 Clean Up Permalinks – This option strips your post URLs of words that are ignored by search engines. It is debated whether this is a good idea, however, I enable it since it makes for cleaner slugs and clearer keyword targeting. Remove the ?replytocom Variable – Checking this will remove the ?replytocom variable from comment reply links. Only important if you run a site with lots of comments as it can increase the crawl efficiency of search spiders. Redirect Ugly URLs – Not needed in many cases. Leave it alone unless you know what you are doing. This menu allows you to add content at the beginning or end of your articles when delivered via RSS. It will help identify you as the original source if content scrapers forget to remove this. You can use several variables, but the given option is usually good enough. 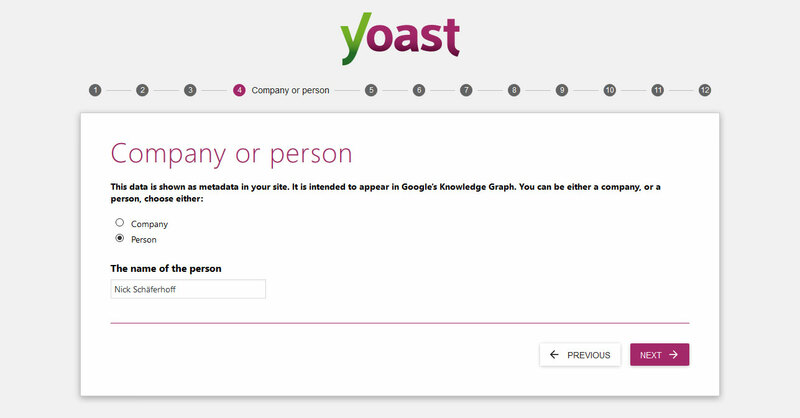 There are a number of tools to make your transition to Yoast SEO a bit easier. Bulk Editor – Edit post titles and meta descriptions en masse instead of one by one. This is very nice if you are installing the plugin on a site that already has a bunch of content on it. File Editor – Directly edit important files such as robots.txt and .htaccess.You can edit both of these files also via FTP. You should generally stay away from them unless you know what you are doing. Inputting something wrong here can completely disable your site for search engines. Import/Export – Import settings from other SEO plugins, or export your own if you want to use them in another site. Simply creating a backup for emergencies is also possible. 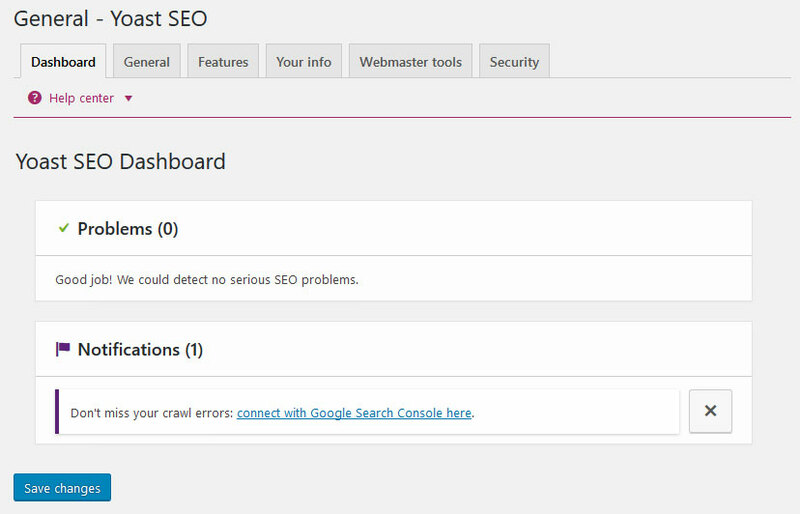 If you have connected your site to Google Search Console, Yoast SEO will show important data like crawl errors and more in this menu so you can fix them. Very useful. 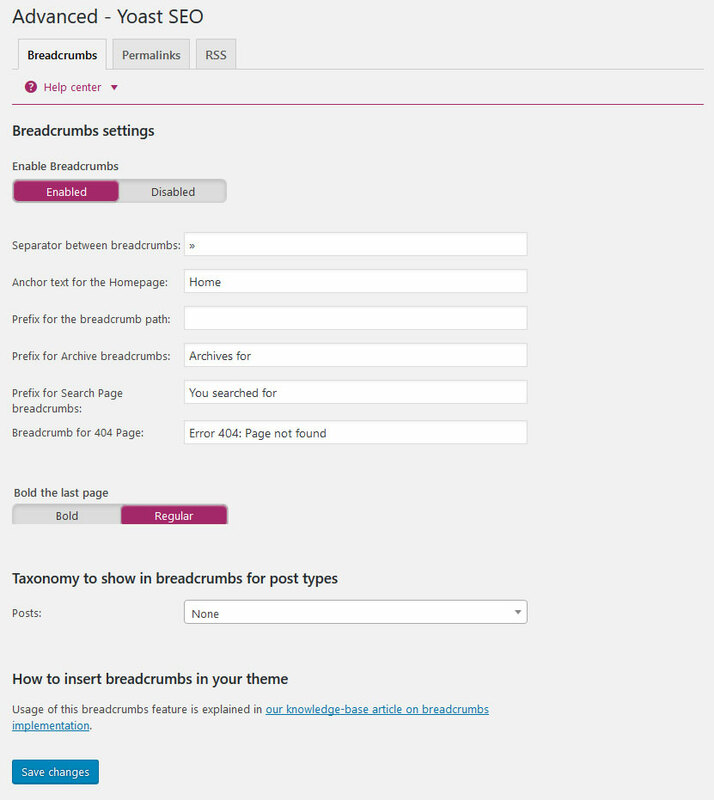 This menu offers a number of premium extensions for Yoast. You can get the advanced version and add-ons for video, news, and local SEO. Knowing Yoast they are probably well worth the money but beyond the scope of this article. Now that we have configured the basic settings, we can move on to a more granular level of the plugin. The following chapter will concentrate on the day-to-day usage of Yoast SEO. Generally speaking, the plugin will help you with three things: Keyword research, page analysis, and, most importantly, content creation. 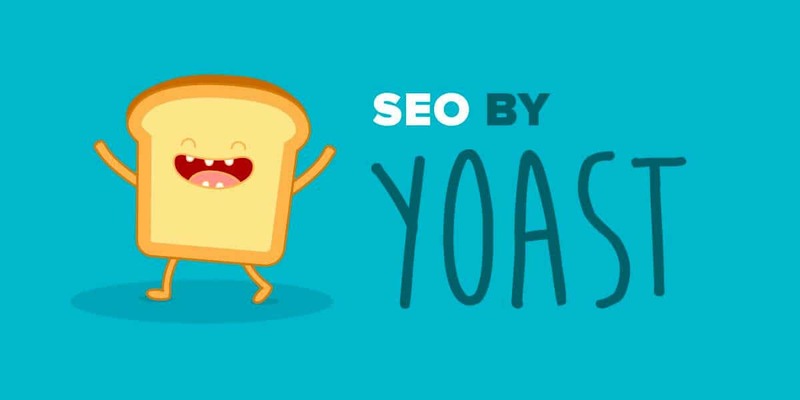 We will quickly go over the first two and then move on to the latter, which is really the tofu and potatoes of Yoast SEO. As you might have noticed, the plugin adds a couple new items for keyword research to the WordPress admin bar. Namely, you will find links to Google’s Keyword Tool, Google Trends, and the SEO Book Keyword Tool. 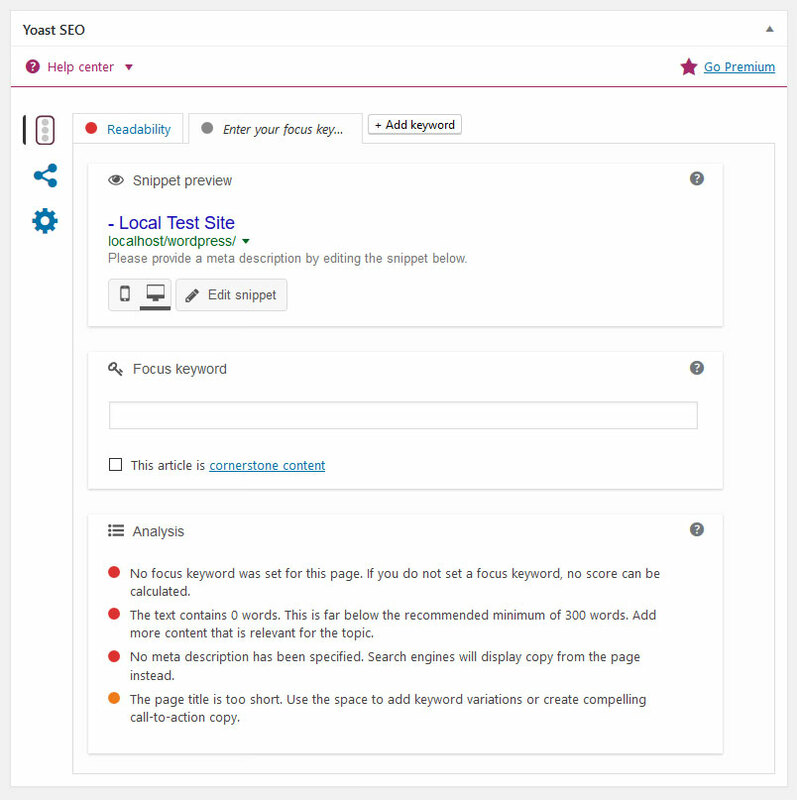 §hen having a look at the admin bar on the front-end of your site with Yoast SEO activated, you will see that there are a number of links that let you gain insights into your on-page SEO. As you can see, the plugin doesn’t perform page analysis itself but helps you connect your content directly to websites that do. Quite a nice touch, if you ask me. Alright, now we are getting to the part where Yoast’s plugin really shines. 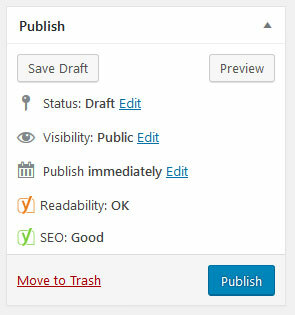 After installing it, you will quickly notice an additional box at the bottom of the WordPress editor. Should you not be able to see this for some reason, check your Screen Option in the upper right corner to see if it has been disabled. Here you can make important changes to your content that will influence how search engines, users, and social platforms will see and render it. You will also find important information about how well your content is optimized and how readable it is, so take good care that you understand what’s coming next. Snippet Preview – If you have ever used Google, this should look very familiar. 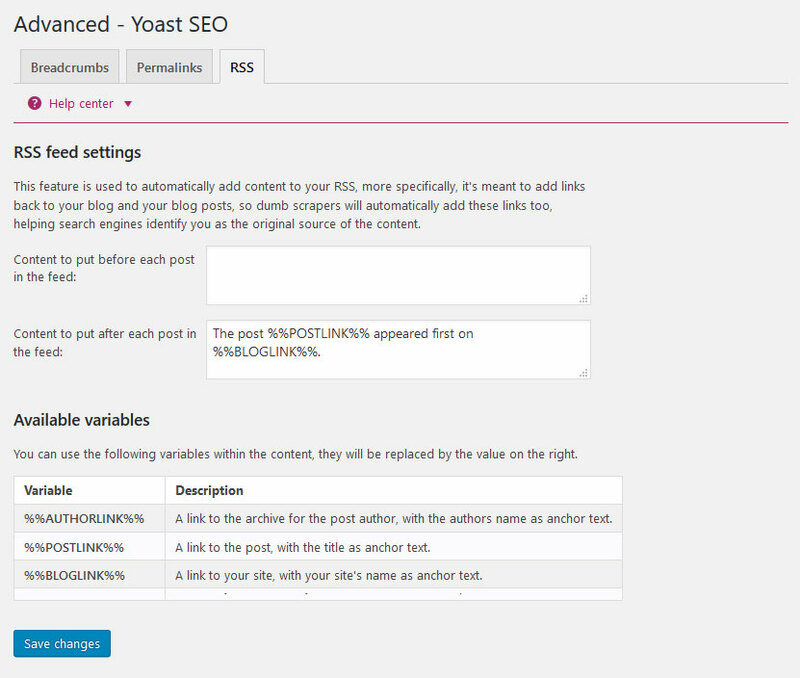 Yoast SEO will render how your post or page will appear within search results. That way you can see if your title, URL and meta description all fit within the SERPs dimensions. Click Edit snippet to make changes to the title, slug and meta description of your post and use the two icons to switch between mobile and desktop view. SEO Title – Here you can set a different blog post title to display for search engines. Very useful if the title you want on your blog is too long or not snappy enough. Be very deliberate about this setting since the title tag is most important for search engines to determine the topic of your content (see also our guide on on-page SEO). Meta Description – The meta description is the text that appears below your title and URL. You can (and should) provide a custom description here that contains your keyword. Failing to do so, the search engines will pull what they think is relevant text from your content. Unfortunately, this might not always be the most descriptive. Focus Keyword – The focus keyword is what best describes your content and what you ultimately hope to rank for. 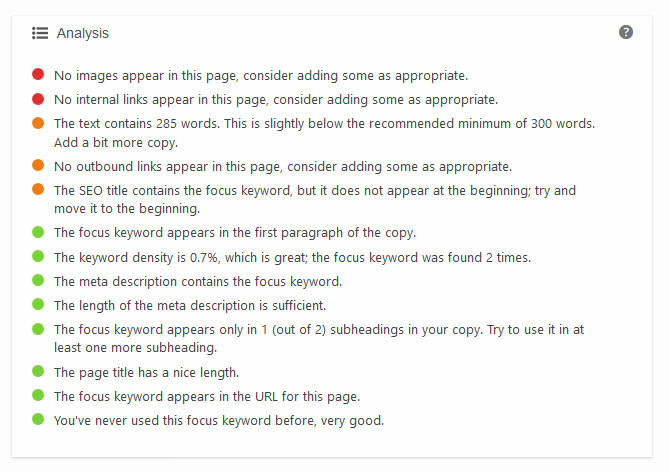 Providing a focus keyword also allows the plugin to determine how well your article is optimized, making it one of the most important settings. Cornerstone content — You also find a checkbox to mark a particular post as cornerstone content. 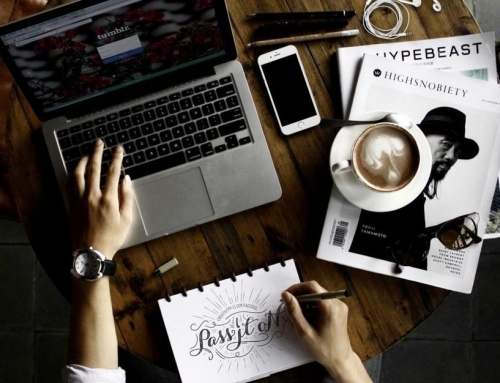 This means content that best communicates what your site, blog or business is about. Find more information about this on the Yoast blog. After setting a focus keyword, the plugin will indicate how well optimized your content is. It will check if and how often your keyword appears in important places such as the heading and title, URL, content, and meta description. You will also find information concerning keyword density and whether the keyword could be placed further at the beginning of the article. Furthermore, the plugin will check for images (and keywords in the ALT tag) as well as links. Basically, it’s like having an SEO expert look over your shoulder at all times. That’s immensely helpful because it eliminates much of the guesswork. In addition to that, a red, orange, or yellow checkbox in the Publish meta box will tell you the overall score of your SEO measures. That way you can understand at a glance if further optimization is needed. What’s very useful about this feature is that it also appears in the list for all your posts and pages. That way you can filter the list by SEO score to quickly find content in need of optimization. However, it’s important to not just blindly follow everything you find in the page analysis. Keep in mind that content should always be written for readers first and search engines second. Don’t sacrifice readability for technicalities. 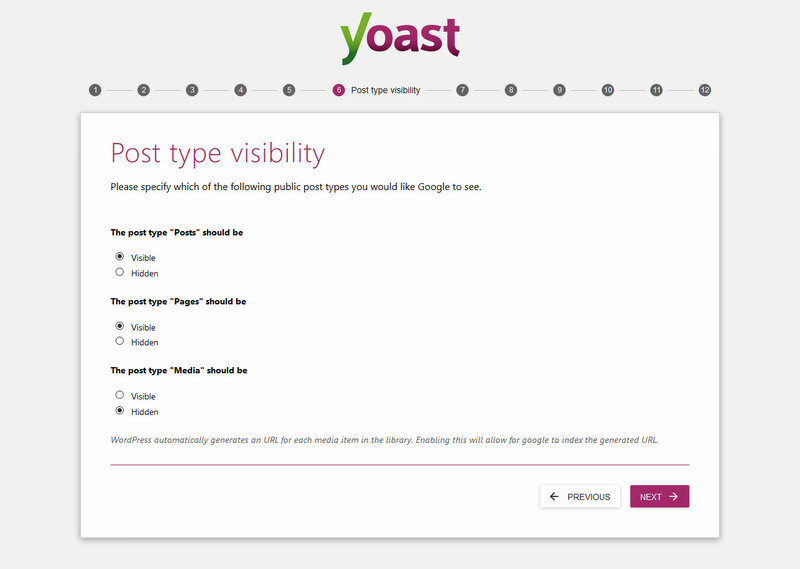 Talking about readability, Yoast comes with its own tool in this area. This is similar to the on-page SEO analysis, however, instead of SEO markers, it checks how easily your content can be consumed by human readers. Joost and his wife talked about the importance of SEO Copywriting in their presentation at WordCamp Europe 2016. They did a lot of research on the matter and have merged it into this part of the plugin. 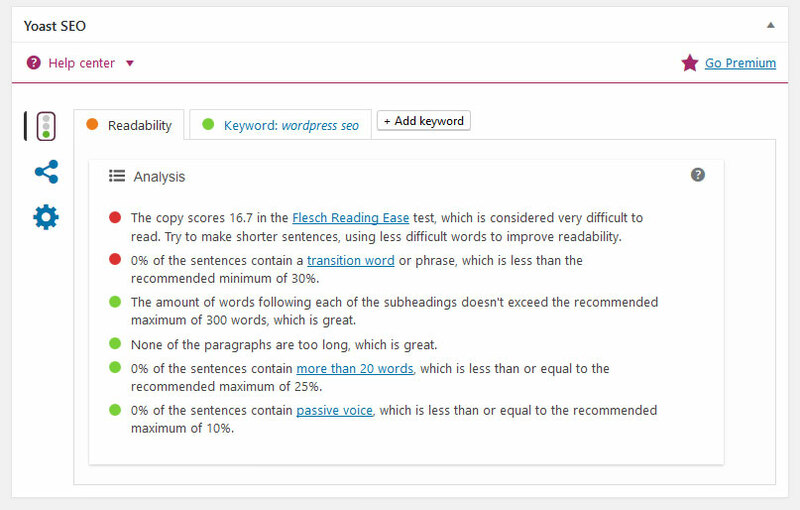 The readability section checks for the number of words following headings, use of passive voice, length of sentences, use of transition words and more. Plus, the plugin even shows you where problems lie. Click on the eye symbol on the right and it will highlight parts of your text that need improvement. By now, I strive to have both readability and keyword analysis greenlit before handing in or publishing any content. When you post your content to Facebook or Twitter, these services will attempt to glean the important information like title, description, and images from the rich snippets of your page. Since not all platforms adhere to the same standards and measurements, it is sometimes necessary to adjust the title length or image size of your posts for different services. All of that happens in this tab. 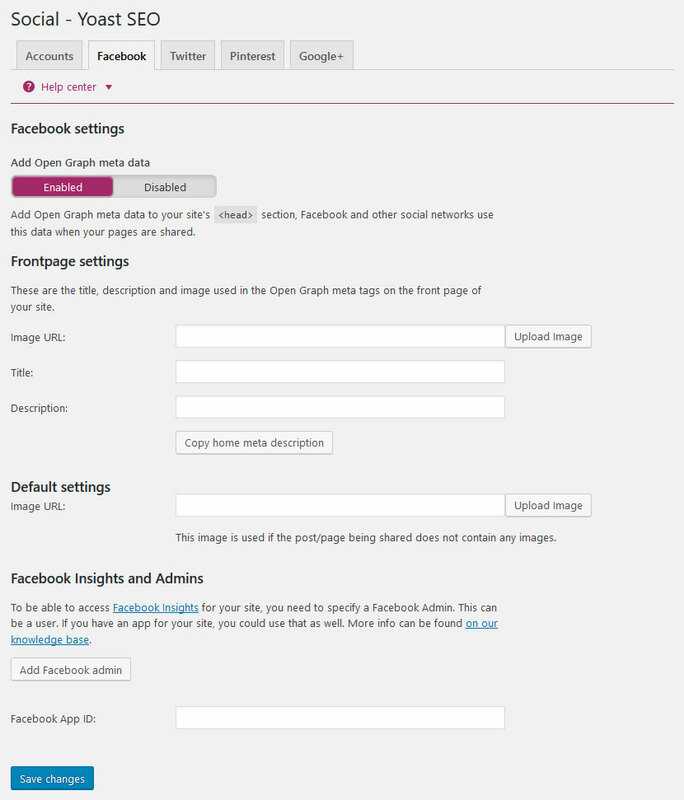 The plugin allows you to specify titles, descriptions, and featured images for Facebook, Twitter and, if enabled, Google+. You can upload images or provide a link. If you are confused about ideal image sizes for the different platforms, the Buffer blog has an excellent article on that. The Advanced tab harbors powerful features (which is why they are by default disabled for any user that is not an administrator). Usually, you should not have to change anything here since we have already adjusted all important site-wide settings. However, for completion’s sake, let’s go over what each option is for. Meta Robots Index – Determine whether to allow search engines to index the post or page or not. Meta Robots Follow – Determine whether or not search engines should follow the links on this page. Meta Robots Advanced – A number of meta tags you will probably never use. Canonical URL – This feature is very useful if you are reposting content that has already appeared somewhere else on the web. Instead of risking a penalty for duplicate content, you can tell Google where the original article resides. With the options above you can optimize the crap out of your content and it is the main reason why Yoast SEO is such a user favorite. Finally, SEO optimization doesn’t stop with posts and pages. You can also adjust different SEO settings for your taxonomy archives such as categories and tags. If you go to the respective menu and click on one of your tags or categories, you will find a similar field further down the page as in the WordPress editor. Here you can make important adjustments for how your taxonomy archives are presented to search engines. Overall that is a good idea in order to turn your category and tag archives into unique content for extra SEO value. As you should be able to understand by now, all of these fields can be used to overwrite global settings. Provide a title and meta description, canonical URLs, and include or exclude the archive from being indexed or included in the sitemap. 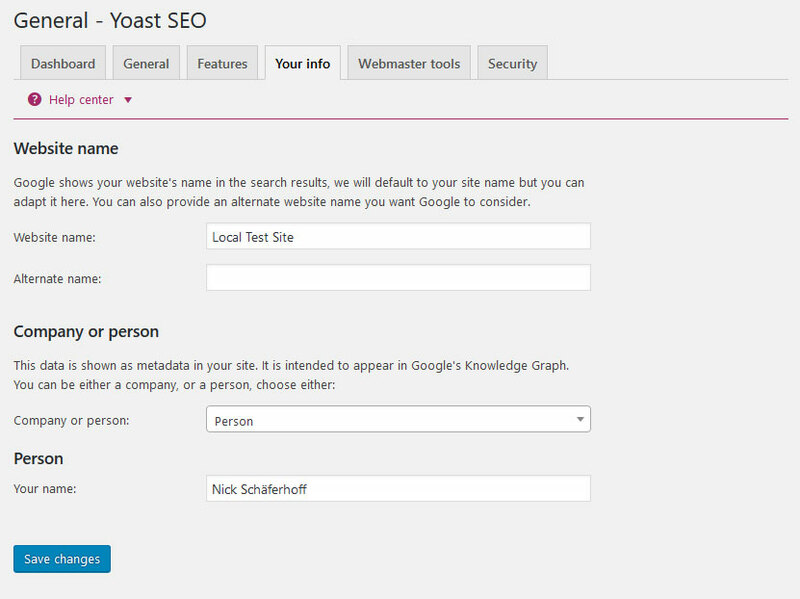 Yoast SEO is a very powerful plugin. It lets you control every important search engine optimization aspect of your WordPress site. From title formats to indexing rules, to search engine appearance, there is very little you can not change. At the same time, the plugin provides you with the knowledge to easily create highly optimized and readable content, gives detailed input on how to improve your posts and pages, and even lets you control your content’s appearance on social platforms. WordPress users and website owners looking to increase their traffic will hardly get around this plugin. It takes much of the guesswork out of optimizing your site and provides invaluable input for growth. While Yoast SEO won’t shoot you automatically to first place in Google, using it is definitely a step in the right direction. I hope that this Yoast SEO tutorial has helped you understand how the plugin can benefit your site as well. Do you use Yoast SEO? Would you configure it differently? What is your experience? Tell us in the comments.